Global blockchain identity management market expected to reach approximately USD 3,454 million by 2024, growing at a CAGR of slightly above 80% between 2018 and 2024. The blockchain identity management systems offer multiple benefits to its users, such as speedy transactions, elimination of malicious activities, and prevention of data breach. The report covers a forecast and an analysis of the blockchain identity management market on a global and regional level. The study provides historical data for 2015, 2016, and 2017 along with a forecast from 2018 to 2024 based on revenue (USD Million). The study includes drivers and restraints for the blockchain identity management market along with the impact they have on the demand over the forecast period. Additionally, the report includes the study of opportunities available in the blockchain identity management market on a global level. This report offers a comprehensive coverage of the global blockchain identity management market along with market trends, drivers, and restraints of the blockchain identity management market. This report includes a detailed competitive scenario and product portfolio of the key vendors. To understand the competitive landscape in the market, an analysis of Porter’s Five Forces model for the blockchain identity management market has also been included. The study encompasses a market attractiveness analysis, wherein all the segments are benchmarked based on their market size, growth rate, and general attractiveness. This report is prepared using data sourced from in-house databases and secondary and primary research teams of industry experts. 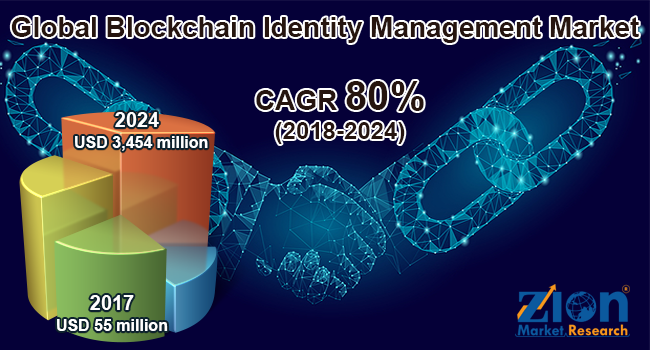 The study provides a decisive view of the blockchain identity management market by segmenting the market based on deployment, application, vertical, and region. By deployment, this market is divided into the public cloud, private cloud, and hybrid cloud. By application, this market is segmented into multi-factor authentication, password management, access management, directory services, and others. The vertical segment is categorized into BFSI, retail, logistics, healthcare, government, IT and telecom, media and entertainment, travel and hospitality, and others. All the segments have been analyzed based on present and future trends and the market is estimated from 2018 to 2024. The regional segmentation includes the current and forecast demand for North America, Europe, Asia Pacific, Latin America, and the Middle East and Africa with further division into major countries, such as the U.S., Canada, Mexico, UK, France, Germany, Italy, China, Japan, India, Australia, South Korea, Brazil, Argentina, and Saudi Arabia, UAE, South Africa, and Israel. The report covers a detailed competitive outlook including the market share and company profiles of the key participants operating in the global blockchain identity management market Some major players operating in this global market are AWS, IBM, Civic Technologies, Bitfury, KYC-Chain, Factom, Oracle, Evernym, Inc., Netki, Inc., UniquID Inc., Peer Ledger, and BlockVerify, among others.